The first time I heard contributor Jim Dixon of RealGoodFood refer to honey-roasted rhubarb, it was one of those slap-my-forehead moments…of course! I've seen the first stalks appear at the farmers' markets and local produce sections of the grocery store, though the plant in my garden (below) is just starting to unfurl its leaves. So wait if you can, but if you can't, grab some and get roastin'! 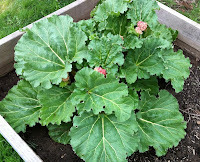 Around here you can depend on rhubarb to be out of the ground and ready to eat before almost anything else. We’re still a few weeks away from when you’ll be able get enough for a couple of pies from that patch on the side of your neighbor’s house, but here’s an old favorite to get you ready for that day. I adapted this recipe from Tenuta di Capezzana, the Tuscan olive oil producer. It’s easy and incredibly delicious. 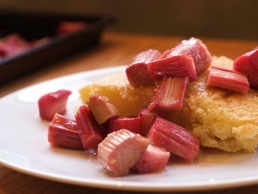 Make one cake now to eat plain, then another when the rhubarb arrives. Butter and flour a 12-inch cake pan (I usually make this in a 12-inch cast iron skillet). In a large bowl, whisk together the eggs and granulated sugar. Add the olive oil, milk and orange zest. In another bowl, stir together the flour, baking powder and salt. Make a well in the dry ingredients, and slowly add the egg mixture, stirring just until blended. Do not over mix. Pour the batter into the prepared pan. Bake until a toothpick inserted into the center comes out clean, 50 to 55 minutes. I let the cake cool in the skillet, and serve it from the pan. but you could let it to cool completely, loosen the sides with a knife, and invert onto a serving plate (hold the plate against cake pan and flip...hopefully it will come out in one piece). Slice a half dozen or so rhubarb stalks into half inch pieces. Toss them with a few tablespoons of olive oil, then arrange on a sheet pan and drizzle with about a half cup of honey. Roast at 350° for about 20 minutes (I do the prep after the cake is in the oven, then cook the rhubarb while the cake is baking). Let cool and spoon over slices of olive oil cake. Photo from Jim Dixon's Produce Diaries at Culinate.com.